I consume a lot of industrial grade matcha- mainly in the form of matcha milk tea from Taiwanese boba joints around town. It's probably all low-end stuff grown in China which I am not particularly opposed to but I thought I would upgrade myself just a notch with some grocery store Japanese matcha make it exactly how I like it at home. I like it milky so there's no point wasting ceremonial grade with matcha lattes. Ceremonial matcha just isn't for me- too precious for my rustic tastes. But I love that grassy slightly bitter matcha flavor in desserts and even more so in a savory context. In my early twenties, my favorite meal was rice swimming in usucha broth along with a side of turnip pickles, a lump of fatty braised pork, and a chinese tea egg. 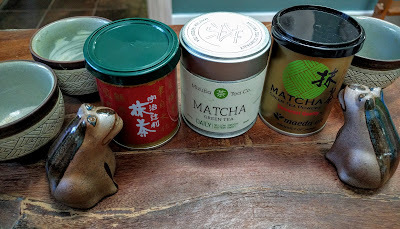 Tea fads come and go in the tea closet and matcha has come around again. My current matcha mission is to find a decent reasonable brand that I can buy locally at the grocery store. I don't want to go overboard obsessively sweeping the internet so I limited myself to three local options out of 8. The problem with matcha is that the clock starts ticking the moment you snip open that shiny mylar bag. If you don't finish it within a few weeks, that creeping stale soapy taste renders it unfit for consumption. I've been doing matcha milk tea three times a day all last week and I am somewhat surprised by the outcome. Mizuba "Daily" Matcha- was indisputably the best of the bunch but for $20 an oz, it better be. My sweet husband found this for me at at Umami Mart- a japanese kitchen boutique in downtown Oakland next to his prototyping shop. It's pretty good- smooth dulcet flavors that offend no one. However I did not find it compellingly better than the Tsujiri for the price point and it's mildness actually made it less suited for creamy additives. The Portland based Mizuba Tea Company is all about sharing the goodness of a 100 year old family farm in Uji so if you are into the feel good factor and don't mind the feel good premium this is a tea for you. 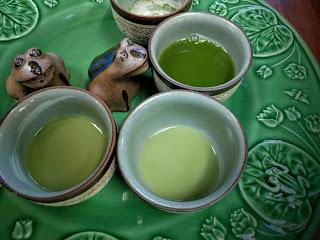 Maeda-en Shiki Matcha : "Universal Grade" which is above their lowest end offering of culinary grade. $10 from Tokyo Fish Market. I did not want to get Maeda-en as I had a prejudice against Maeda-en being more of an industrial grade matcha, but judging by the expiry dates of other brands, this appeared to be the freshest on the shelf. Nonetheless, it was clumpy, bitter and astringent in an unpleasant way when consumed straight. I was hugely regretful until I tried making a smoothie with a nino banana. Like over-roasted coffee beans, the flavor shines through when mediated with a lot of fat and sugar. While I would not buy this again, I was relieved that I found a way to consume this tea. I had been bummed out about having to trudge through even an ounce of bitterness. So without too much fuss, I found a decent daily option in the Uji Tsujiri matcha. I don't think I can find better at $7 per oz. for Japanese Uji matcha. I was contemplating Chinese versions to compare but I would have to get a mylar heat sealer as the Chinese versions come in pound sized bags. I also think my matcha latte craze will blow over in a month and so the thought of committing to a pound of matcha hurts my head. 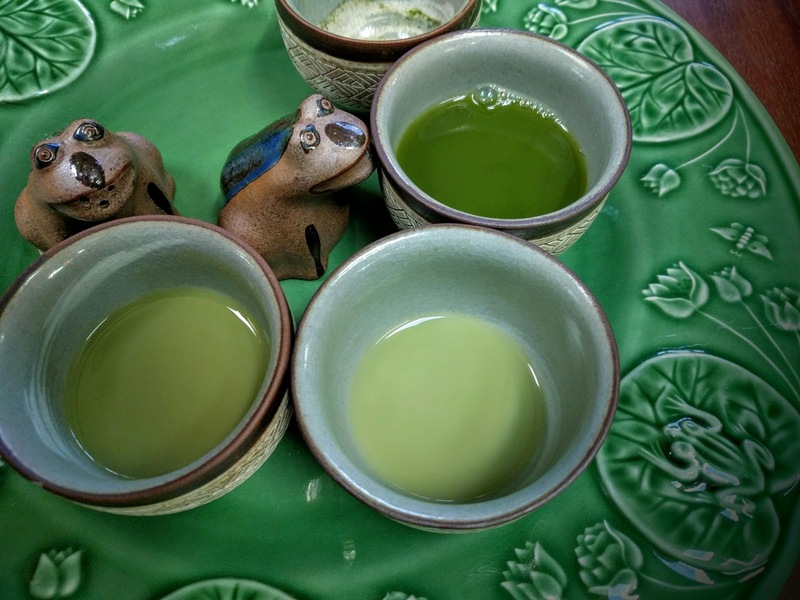 Matcha milk tea is yum, it is love, and so is your informative and interesting post. Absolutely loved every bit of it. Keep it work, will see you later.